The spiny waterflea (Bythotrephes longimanus), an invasive zooplankton in the Great Lakes, is using evolution and adaptive plasticity to escape being eaten by fish. Like the bloody red shrimp, the spiny waterflea entered the Great Lakes through ballast water discharge. The spiny waterflea was first found in the Great Lakes in 1982 and negatively affects the ecosystem by competing with native zooplankton and small fish for food. This species can reach up to a half inch in length and has a rigid tail spine about twice as long as its body, which prevents it from being eaten by many small fishes. A recent project, funded by the commission and conducted by Dr. Andrea Miehls and collaborators Professors Scott Peacor at Michigan State University and Andrew McAdam at the University of Guelph, studied the spiny waterflea to understand how its spine might change in response to fish predators. The researchers found that this non-native species can adapt its defensive spine in several ways to thwart fish predators. In Lake Michigan, Dr. Miehls and colleagues found that spiny waterfleas use increasing water temperature as a sign of greater risk of predation by young fish. Spiny waterflea mothers respond to this risk by giving birth to offspring with longer defensive spines. By increasing spine length of offspring, mothers help their offspring outgrow the mouth size of their young fish predators to increase their survival. The effect of temperature on spine length is called "adaptive plasticity," and research by Dr. Miehls shows that adaptive plasticity in spine length was likely important to successful invasion of spiny waterfleas into Lake Michigan. In Canadian lakes, Dr. Miehls and colleagues identified another way that spiny waterfleas can thwart predation by young fish: evolution of spine length. In lakes where predators are mostly young fish with small mouths, researchers discovered that spiny waterfleas with longer spines survive better, which appears to be leading to evolution of longer spines through time. Because all lakes in the study were invaded less than 20 years previously, evolution of spine length occurred rapidly. Longer spine length through evolution and adaptive plasticity makes the spiny waterflea a less available prey for young fish in the Great Lakes region that are already being starved by competition for food with the spiny waterflea and other invasive species. "Spiny waterfleas are a great example of why species invasions can be so devastating to ecosystems," said Dr. Miehls. "We have known for decades that the abundance of invasive species negatively affects food webs; we are now only beginning to appreciate the importance that evolution and adaptive plasticity can play in the negative effects of invasive species." This work is a novel discovery for how species adapt to environmental change. The findings have been accepted for publication in the journals Evolutionary Applications (http://onlinelibrary.wiley.com/doi/10.1111/j.1752-4571.2011.00221.x/abstract) and Ecology (link not yet available). New research, sponsored by the Great Lakes Fishery Commission, suggests the bloody red shrimp lives up to its frightening name. The bloody red shrimp (Hemimysis anomala) was first found in the Great Lakes in 2006 and is related to the native opossum shrimp (Mysis diluviana), although it can be distinguished from the native species by its namesake red coloration. The species became established after foreign ship ballast containing live bloody red shrimp was discharged into the Great Lakes. Fully-grown bloody red shrimp are only about a quarter- to a half-inch long, but they colonize new areas quickly and have affected food webs in European waters. The species has been found in lakes Michigan, Huron, Erie, and Ontario, as well as inland waters in the Lake Ontario watershed. Should we be worried about damage to our Great Lakes fisheries by this tiny crustacean with the horror-movie name? 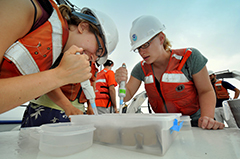 With funding from the commission, scientists at the U.S. Geological Survey's (USGS) Great Lakes Science Center and Cornell University recently completed a project to answer this question. 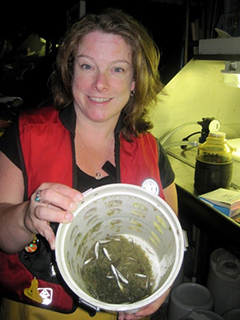 The team, led by Dr. Maureen Walsh of the USGS Great Lakes Science Center's Lake Ontario Biological Station, found that when the bloody red shrimp reaches large numbers they could easily compete with certain fish species. 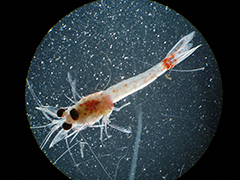 The invasive shrimp was an opportunistic feeder on zooplankton, which are important food for some fishes. The team also found that the bloody red shrimp tolerates a broad range of temperatures and depths and can reproduce multiple times per season. These conclusions suggest that the bloody red shrimp could become abundant in nearshore areas of the Great Lakes, where fish are abundant and where humans interact most frequently with the resource. The researchers noted, however, that potential impacts of the bloody red shrimp are likely to be limited to areas where the shrimp are protected from fish predators. Several fish species that live in nearshore areas of the Great Lakes, including the recreationally important yellow perch (Perca flavescens), fed on bloody red shrimp. The non-native alewife (Alosa pseudoharengus), which functions as the primary food source for salmon, also ate large numbers of bloody red shrimp when they were available. Lab experiments conducted by the scientists showed that the shrimp changed their behavior when threatened by the presence of a predator. "These results suggest that the ability of the bloody red shrimp to expand beyond areas that offer refuge from predation may be limited," said Walsh. "This information will be useful to help managers predict how this invasive species might affect the ecosystem if it expands across the Great Lakes or to inland waters." 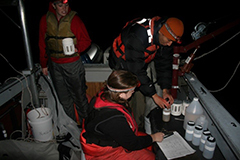 Findings from these studies have been published in the Journal of Great Lakes Research and Hydrobiologia. See http://www.sciencedirect.com/science/journal/03801330/38/supp/S2 for more information. 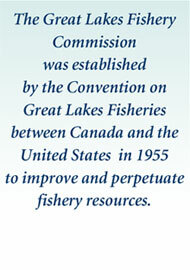 "Invasive species are the scourge of the Great Lakes," said Commission Chair Mike Hansen. "Not all of the 180-plus non-native species are harmful, but some inflict severe ecological and economic damage to Great Lakes ecosystems." Hansen continued: "Small zooplankton, like the spiny waterflea and bloody red shrimp that exist at the bottom of the food web, are particularly insidious. When the bottom of the food web is disrupted, substantial effects ripple through the lakes. Ecosystem stability and sustainability are often the first casualties." "Recent research on the spiny waterflea and bloody red shrimp add to our knowledge about harmful effects of these invasive species. This research demonstrates that these small organisms can alter the environment and thereby threaten valuable fisheries. This research should further support efforts to stop biological invasions into our Great Lakes," Hansen concluded. Zooplankton are microscopic organisms that are collected from Lake Michigan using a fine-mesh net. The net is lowered to a specific water depth and then pulled upward through the water column. The net filters zooplankton as it is lifted through the water, which are concentrated in a cup at the bottom of the net. 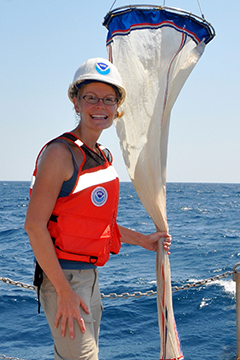 Once on board the ship, any zooplankton still clinging to the net mesh are rinsed into the cup with water. Spiny water fleas are picked from the zooplankton collected and transferred to holding containers using pipets. Containers are then transferred to the lab where the spiny water fleas are reared for multiple generations in incubators.